Enjoy a thrilling one hour trial helicopter lesson in a Robinson 44 at Goodwood Aerodrome, West Sussex. Be taught by experts and learn many important chopper flying techniques. Reach for the sky and learn from the best during this superb one hour trial helicopter flying lesson in West Sussex! You will be flying in an area allocated just for training at the Goodwood Aerodrome; because your flight instructors are also experienced commercial pilots, you can rest assured that you're in the best hands possible. During this fantastic one hour session you will gain plenty of hands-on flying experience, and because the Robinson 44 has two back seats, you can also bring your friends or family along for the ride! You can take over the controls once you're up in the air and try piloting this awesome vehicle yourself - it's not as hard as you might think and one hour is plenty of time to get the hang of it, so you'll soon be swooping through the sky like the pros! Flying a helicopter is an incredibly exciting and unique activity, and must be experienced to be believed ... so give it a go today and see how far you come!On arrival at the Goodwood Aerodrome in West Sussex, you will be greeted by the ground crew and given a full safety and pre-flight briefing from your experienced pilot.You will then board the Robinson 44 and go important basic information such as how the helicopter flies and what the controls do, and then it's time for take-off! Once you're up in the sky you can take over the controls and have a go at flying yourself; you'll go over several important flying techniques during this one hour lesson, so you will soon learn the skills needed to get airborne. Robinson 44 Trial Helicopter Flying Lessons in Sussex are available 7 days a week, subject to demand and availability. Your Robinson 44 Trial Helicopter Flying Lesson in Sussex includes 60 minutes flying time, although you will may be at the centre for approximately an hour and a half due to safety briefings and a de-brief. Participants: The One Hour Trial Helicopter Lesson in a R44 in Sussex is for 1 participant. You are welcome bring family and friends along with you to watch your Robinson 44 Trial Helicopter Flying Lesson in Sussex; there is room for two people in the back two seats of the helicopter, so friends and family can come along for the ride. There is also a viewing lounge at the centre which looks out over the helicopter operating area, so this is ideal for other spectators to view the flying activities. You should wear comfortable, casual clothes for your Robinson 44 Trial Helicopter Flying Lesson in Sussex. All safety equipment will be provided by the centre. Robinson 44 Helicopter Lessons are weather dependent; please contact the centre on the day of your lesson if you are unsure about the weather conditions. We were fortunate to choose a very clear day. The Robinson R44 was beautifully presented and Tony our pilot and tutor explained the controls to us very clearly and patiently, instilling confidence. Very exciting flight including flying over our house Organised on time and very professionaly carried out. One for the bucket list!! This week we are going in a completely different direction by talking to Jonny from Drift Limits, boasting the UK’s fastest drifting experience. If you’re a fan of driving days, super cars and all things speedy, then this is definitely an experience worth reading about. 1) Hi Jonny, please explain your journey as ‘Drift Limits’ so far. Since the early days of getting into motorsport I did a few driving experiences but really felt they lacked integrity for the keen petrol head, I found they were very restricted in terms of how hard you can push the cars. I have been racing for 3 years and then moved onto become an ARDS instructor with the ambition of developing a driving experience where you can really lean about car control and follow our motto ‘ find your limit’ at the UK’s fastest drifting experience. The type of job it is means you’re constantly on your toes. It can be incredibly rewarding watching guests progress their skills in a short period of time. I guess I’m fortunate in being able to say I love what I do. 2) Yes that must be rewarding, what has been the biggest or most memorable event you have provided? Ah, so many awesome days! Last week we had Harry Main and Buttsy Butler from Monster come up and play. We also had a demo shoot for Jack Reaper stunts which was good fun despite all the screaming in my ear! 3) Sounds great! Is there any inside information you can give us? Yes, definitely – come to one of our days and we will divulge! Ha, really just listen to the instructors to get the most out of the day. Be patient and you will progress quicker. 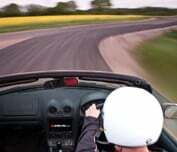 Some people find the 3rd gear corner very daunting sideways at 60mph. You have to focus and forget about what you previously thought was possible. After a session at Drift Limits you’ll come away a better driver and obtain new skills in the car control department. The track experiences allow guests to drive dream cars that are bonkers fast! 4) Do you have any exciting plans for the future that you’d like to tell us about? Big plans – the track layout is currently being extended and resurfaced, and it is already the fastest drifting experience in the UK. We have a Ferrari 430 GT3 race car and Formula Renaults joining the fleet soon, so we’ll have quite a few more experiences to offer looking forward. Thank you for talking to us, Jonny, definitely something I would love to try! Stay tuned for more information drifting experiences.